This is only the 2nd home-brew competition I've entered. Actually, it is also the 2nd competition this beer has been entered into. It scored pretty well in its first competition, but based on the comments, I realized that it turned out more as a Northern German Altbier than the Düsseldorf Altbier that I entered it in. For the NHC, I "fixed" the beer by entering it in the more appropriate sub-category. To be honest, when I entered it into the first competition, it was probably too young. It has only been in the bottle for 10 days, which is not really even enough for it to get carbonated. The additional conditioning time before NHC regional judging certainly improved the beer. I also entered three other beers, which all scored well, but did not place in their respective categories. I have not gotten the score sheet back on those beers, but I know things that kept them out contention. If I were a more organized competition brewer, I know I could add 5 to 10 points to each of those beers to improve their position. Pick Denver, CO as the judging center. 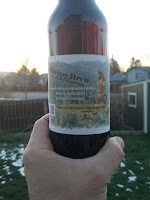 Scroll down to Category 7 : Amber Hybrid Beer. Under 1st place, it says "Eric Shepard of Littleton, CO" ... and that refers to me. To be very honest, seeing my 1st place announcement shocked the hell out of me. This beer was exactly what I thought a German Altbier should be, but I am certainly not a trained BJCP judge. I know that there are GREAT brewers entering beers in the Denver region. I entered the competition to get the unbiased score-sheet feedback on my beer. Only in my wildest dreams did I think I would stand a chance to advance to the finals. Not even in my wildest dreams did I imagine a first place finish. As I mentioned above, I am not even sure what "mini-best-of-show" even means, so that wasn't even on my radar to consider. And so, here is the thing. When you get a 1st, 2nd, or 3rd place finish with a score over a certain number, your beer advances to the National Finals. I did not save enough beer (I need 3 bottles) to send to Philadelphia for judging. So now (darn the luck), I have to brew another batch of Sasquatch Hunter German Altbier so that I have something to send to the National competition. I purchased the ingredients Thursday, and my wife and I will be brewing batch 2 Saturday. Pretty exciting ... don't you think? I've actually been telling people that I didn't have any left, but I looked in my fridge just now and realized I have been lying. I do have one bomber (which is less than 3). You can bet that I'll share how the brew day goes. I'll let you know how I do in the National Competition (late June they announce the winners). In the meantime ... feel free to be impressed. Congrats! Next stop the big leagues! Thanks, Dave. Not sure about the bigs leagues. It does feel awesome to get an award, though.